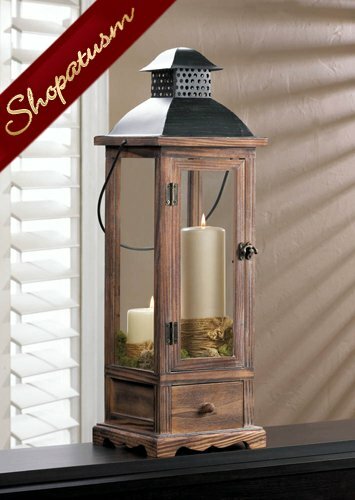 This is for a Rustic Pine Wood Centerpiece Large Wood Candle Lantern from Shopatusm. 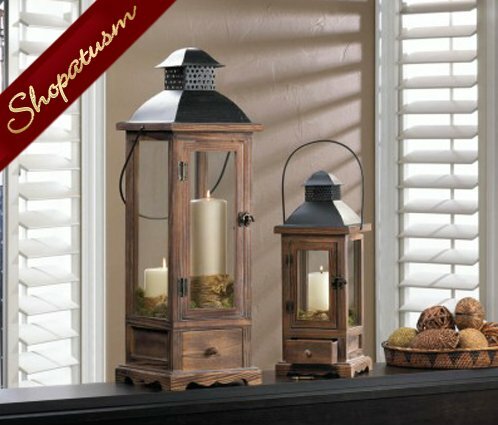 The unique wooden framework holds four clear glass panels and is topped with a metal roof, but the real charmer is the neat pullout drawer in the base. Item weight: 5.8 lbs. 8 inch x 8 inch x 25 3/4 inch high; 27 1/2 inch high with handle. Pine wood, MDF wood, glass and iron. Candle not included.